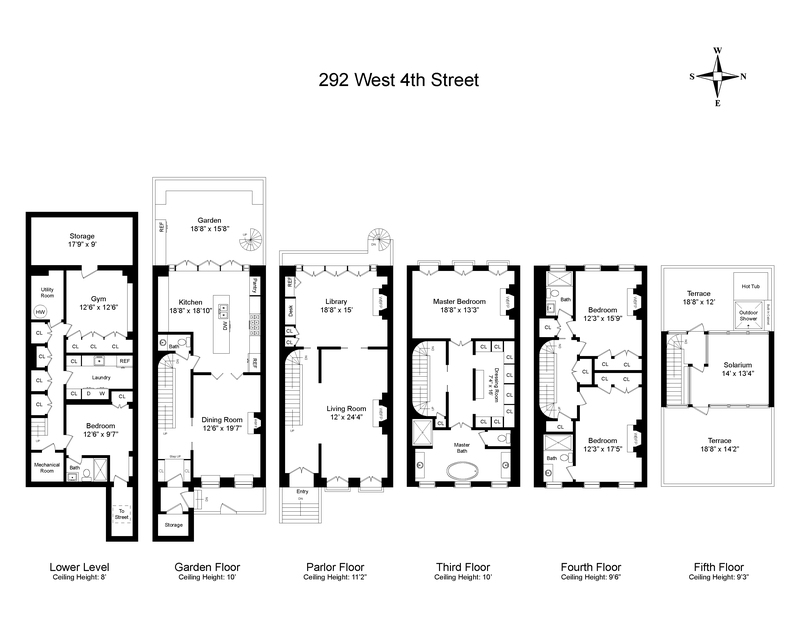 292 West 4th Street, New York, NY 10014 | Sotheby's International Realty, Inc.
$18,000,000 4 Bedrooms4 Full / 1 Partial Baths4,250 sq. ft. Located on a tree lined block, 292 West 4th St has the very good fortune to enjoy its own lovely garden, and to be situated on the prettiest and most bucolic collection of gardens in the heart of the Village. Moreover the house boasts a unique and coveted mid-block position on W 4th St, thereby also benefiting from the vista of lush and verdant gardens belonging to the neighboring houses on West 11th and Bank. Built in 1860, this extraordinary 20 wide Italianate house has recently undergone an extensive renovation designed by Piet Boon. The delightfully serene interior represents a successful melding of restored original architectural details and exemplary contemporary finishes while the faade incorporates a stoop with wrought iron detailing. Notable features include high ceilings throughout, 6 WBFPs and a Parlor Floor Terrace. Plus there are two large Rooftop Terraces that incorporate a hot tub & outdoor shower and are separated by a glass Solarium with views of the Empire State building. The Parlor Floor includes a Living Room and Library with two gorgeous and original stone fireplaces that balance and focus this grand entertaining space. Beautiful herringbone hardwood floors further enhance these dramatic rooms and are continued throughout the house. The Library enjoys three massive floor to ceiling French doors opening onto the Terrace which allow for tremendous sun. On the level above, there is a Master Bedroom with an absolutely extraordinary Bath entirely finished in book-ended Statuario marble. Upstairs there are two further Bedrooms with white marble Baths and WBFPs. The garden level includes a fabulous eat in Kitchen that opens to expansive trellised outdoor space and also incorporates a very pretty Dining Room. Below there is a Staff Suite, a Laundry Room, Gym & lots of storage. Recently featured in Elle Decor, this distinguished New York residence effortlessly combines traditional townhouse living with a classic yet chic modern aesthetic. Located on a tree lined block, 292 West 4th St has the very good fortune to enjoy its own lovely garden, and to be situated on the prettiest and most bucolic collection of gardens in the heart of the Village. Moreover the house boasts a unique and coveted mid-block position on W 4th St, thereby also benefiting from the vista of lush and verdant gardens belonging to the neighboring houses on West 11th and Bank. Built in 1860, this extraordinary 20’ wide Italianate house has recently undergone an extensive renovation designed by Piet Boon. The delightfully serene interior represents a successful melding of restored original architectural details and exemplary contemporary finishes while the façade incorporates a stoop with wrought iron detailing. Notable features include high ceilings throughout, 6 WBFPs and a Parlor Floor Terrace. Plus there are two large Rooftop Terraces that incorporate a hot tub & outdoor shower and are separated by a glass Solarium with views of the Empire State building. The Parlor Floor includes a Living Room and Library with two gorgeous and original stone fireplaces that balance and focus this grand entertaining space. Beautiful herringbone hardwood floors further enhance these dramatic rooms and are continued throughout the house. The Library enjoys three massive floor to ceiling French doors opening onto the Terrace which allow for tremendous sun. On the level above, there is a Master Bedroom with an absolutely extraordinary Bath entirely finished in book-ended Statuario marble. Upstairs there are two further Bedrooms with white marble Baths and WBFPs. The garden level includes a fabulous eat in Kitchen that opens to expansive trellised outdoor space and also incorporates a very pretty Dining Room. Below there is a Staff Suite, a Laundry Room, Gym & lots of storage. 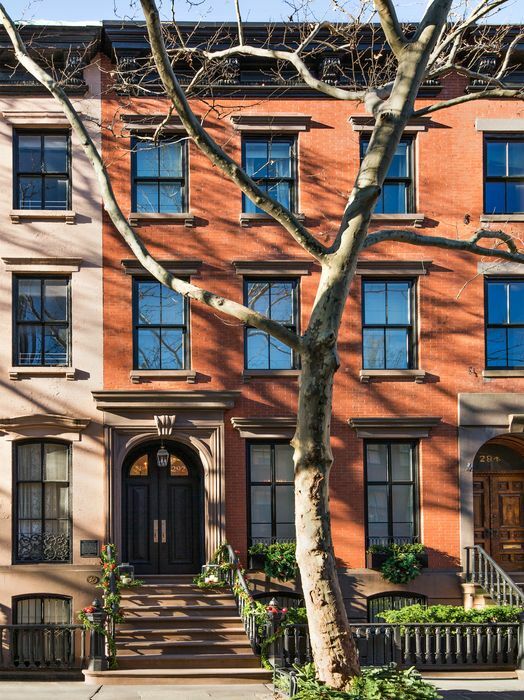 Recently featured in Elle Décor, this distinguished New York residence effortlessly combines traditional townhouse living with a classic yet chic modern aesthetic.